Few mysteries and legends have ever arisen such passionate controversies as the Royal Library of Alexandria, definitely the greatest library of the Ancient world. When exactly was it built? How many times was it burnt down and by whom? Did it shelter some 40,000 scrolls, or about 120,000 (as the librarian Callimachus of Cyrene registered in his catalogue), or a lot more? Was the core of this antique book collection the secret house of the Order of Hermes, the members of which explored magic and knowledge of a universe ruled by beauty and harmony? Stories about the Royal Library of Alexandria have been written and told for many centuries, getting embellished all the time, melting historical data with less accurate information, which makes it quite difficult for the historians to dissociate truth from myth. In fact, there was not just one royal library in Alexandria around 297 BC, but at least two. And we still do not know for sure if they were founded during the reign of Ptolemy I Soter or his son’s, Ptolemy II. Anyway, a splendid building was dedicated to the glory of the Muses, the nine goddesses of art, and was called the Museion, located near the royal palace. Another library was created nearby, in the temple of Seraphis, called the Serapeum. Their main mission was to collect the world’s knowledge – science, medicine, religion, literature -, even though quite aggressive approaches. The Egyptian soldiers were said to forcibly pull documents from the ships entering the harbor in order to enlarge the library’s collection. Then, on royal decree of Ptolemy, all the visitors of the city were required to “offer” all the books and scrolls they possessed, in any language, so that the scribed might copy them, or preserve the originals in the library. Situated between the mainland and Pharos Island, leading producer of papyrus, Alexandria played host to the most brilliant scholars of the time, who were invited there to give conferences, to study, translate and work, some of them becoming permanent residents. 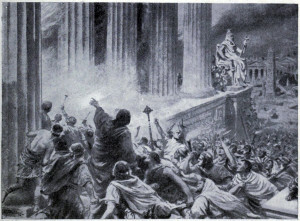 The Royal Library of Alexandria is said to have been burned at least three times, by a Roman – Julius Caesar, a Christian – the Patriarch Theophilus of Alexandria, and a Muslim – the Caliph Omar of Damascus, but it is important to understand that the town underwent numerous earthquakes and floods, meaning that the palace quarter has been underwater for a long time and almost inaccessible for the archaeologists. The legend says – but according to the few historical testimonies, it is not very reliable – that Julius Caesar is responsible for having destroyed the most important library of the Ancient world while pursuing his eternal rival, Pompey. 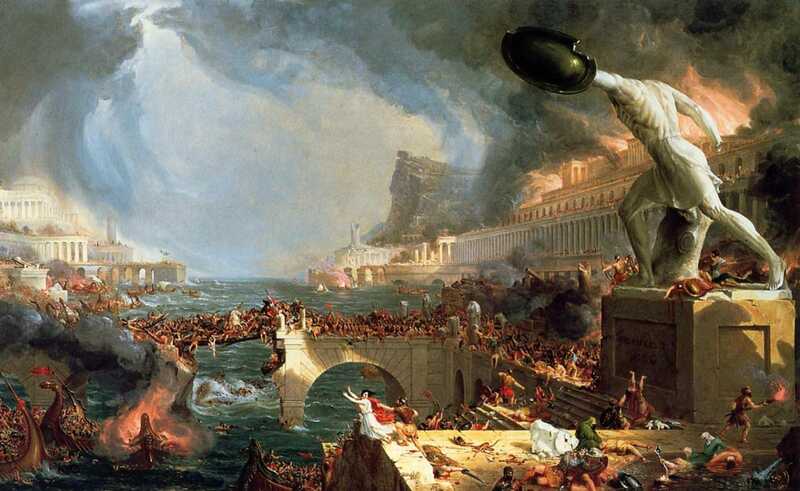 In 47-48 BC, Caesar sent fire ships into the harbor to burn the enemy fleet, but the fire did not stop and spread from the shore to the Library, reducing more than 400,000 scrolls to ashes. This belief in Julius Caesar’s guilt is largely spread, but there is no first hand evidence to support it. Some esoteric writings state that the librarians had their secret hidden places where they kept the most precious documents, preserving them for any possible fire, attack or other calamity. There is no proof of this, but the fact is that the library’s resurrection is beyond doubt. By the end of the 4th century A.D., it was not easy to be a pagan or to have a classical culture. The new religion, Christianity, was constantly strangling the ancient wisdom in all of its forms. Theophilus, Patriarch of Alexandria, was informed about the treasures kept in the Great Library of Alexandria, and he understood that as long as that threaten existed, people would be less attracted by the Bible. So he probably sent word to Rome to ask the emperor Theodosius the Great for permission to pull down the Serapeum and to set to fire the memory of a fading world. Finally, the library slowly came to life again, but not for long, as in the 7th century, the Muslims invaded Egypt and the fanatism of the local Arab general made him fear the influence of this world-wide knowledge. The legend says that he sent word to Mecca, to Caliph Omar, to ask for advice, and the reply of the latter remained in the oral tradition as a masterpiece of religious intolerance. Omar ordered the books to be destroyed, because “they will either contradict the Koran, in which case they are heresy, or they will agree with it, so they are superfluous.” And that was the third devastation of human intellectual and spiritual freedom. The stories pretend that the scrolls and books of the Great Library were distributed as fuel for the bathhouses of Alexandria.